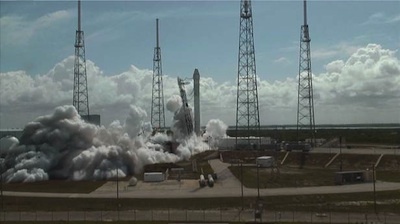 Nine kerosene-fueled engines mounted on the bottom of SpaceX's Falcon 9 rocket fired at full power for two seconds Monday, completing a key test on a Cape Canaveral launch pad before departing to the International Space Station as soon as May 7. The engines ignited at 4:15 p.m. EDT (2015 GMT), firing for about three-and-a-half seconds and reaching full thrust for about two seconds. Called a static fire, or hotfire, the test verifies the engines, rocket and ground systems are ready for launch. "Woohoo, rocket hold down firing completed and all looks good!" SpaceX founder and chief designer Elon Musk tweeted minutes after the hotfire. Engineers will spend the next several days reviewing data from the hotfire test to ensure all systems performed as designed. Stationed inside a control center south of the seaside launch pad, the SpaceX launch team loaded the 157-foot-tall rocket with kerosene and liquid oxygen propellants Monday afternoon as the countdown ticked toward zero at 3 p.m. EDT (1900 GMT). But officials held the countdown at T-minus 47 seconds due to a technical issue. After resolving the problem, SpaceX recycled the countdown and succeeded with the ignition of the rocket's nine Merlin 1C engines at 4:15 p.m. The Merlin 1C engines can generate more than 800,000 pounds of thrust at sea level. The expendable Falcon 9 rocket has flown twice so far, successfully reaching orbit on both tries in 2010. Workers will lower the 157-foot-tall Falcon 9 rocket from the Complex 40 launch facility in the next few days for final checks and preparations before launch, which remains scheduled for May 7 at 9:38 a.m. EDT (1338 GMT). The instantaneous window is timed so the rocket's Dragon payload can reach the International Space Station. A flyby of the complex is planned May 9 to test the Dragon's guidance, navigation and control systems before NASA gives the go-ahead for the capsule to approach the space station for berthing May 10. If the mission launches May 7 and the spacecraft works as expected, the space station's robotic arm will grapple the free-floating Dragon capsule in the early morning hours of May 10, U.S. time. Astronauts will open hatches leading to the automated spaceship May 11 and begin unloading 1,146 pounds of cargo from the craft's pressurized cabin. After stowing 1,455 pounds of gear for return to Earth, the crew will release the Dragon spacecraft May 25, putting the capsule on course for a parachute-assisted splashdown landing in the Pacific Ocean the same day. The 18-day flight is a demonstration conducted under NASA's Commercial Orbital Transportation Services program, a public-private partnership between the space agency and SpaceX to develop the Falcon 9 rocket and Dragon spacecraft to resupply the space station. NASA signed a $1.6 billion contract with SpaceX in 2008 for at least 12 operational Dragon cargo delivery flights. Along with Orbital Sciences Corp., NASA's other commercial cargo partner, the Dragon will replace some of the resupply abilities of the space shuttle lost after the program's end last year. Until domestic cargo services resume, NASA must rely on Russian, Japanese and European logistics freighters to deliver U.S. supplies to the space station. Crew transportation will remain the responsibility of Russia until at least 2017, when NASA hopes U.S. companies will be capable of ferrying astronauts to and from the space station.